In the mid-1960s NASA flew the Gemini missions to develop and practice all the activities that were going to be needed for the subsequent Apollo missions to the Moon. The Gemini was a small, two-person capsule that was used for rendezvous and docking experiments, orbit change maneuvers, long-duration flights, and spacewalks in low Earth orbit. 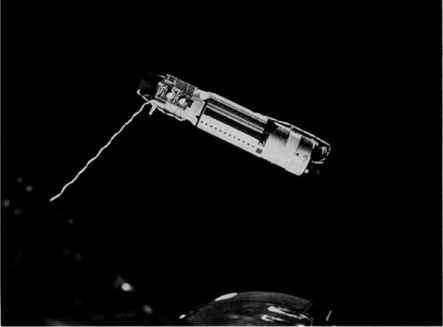 Tether experiments were performed on two of the Gemini missions—Gemini 11 and 12. The Gemini 11 experiments marked the first time that a tether was flown in space, and the fact that the mission involved an astronaut crew made it especially exciting. The general plan was first to dock the Gemini to an earlier launched uncrewed Agena satellite, after which one of the astronauts would take a spacewalk and attach a tether between the Gemini and the Agena. Next, the astronauts would undock, and the two spacecraft would continue to orbit connected by the tether. Without active control, the gravity-gradient effect would assert itself and ensure that one of the connected spacecraft would start to orbit below the other, with the tether perpendicular to the Earth's surface (as explained in the section Momentum Exchange in Chapter 1). Another possibility was to induce a rotation with Gemini's small rocket thruster attitude control system, making the two spacecraft rotate around their common center of mass. Not only was this to ensure that the tether would remain taut and the two spacecraft in a fixed position with respect to each other, it would also induce a level of artificial gravity. NASA decided to try both techniques (Fig. 4.1). The NASA Gemini flight operations performed an analysis that showed how the plan could work, then passed the data on to McDonnell, the company in charge of developing and building the Gemini vehicles. McDonnell's guidance and control group found that a reasonable amount of tension in the cable could be produced using a tether of length less than 50 meters (165 feet) and a spacecraft rotation rate of no more than 10 degrees per second. The tether was to be made of artificial nylon or Dacron fibers, so that it would be thin and lightweight yet strong enough to handle the pulling force between the Gemini and the Agena. Eventually a 36-meter (118-feet) Dacron line was selected. With respect to safety, the only major question was how to release the Gemini from the Agena and the tether afterward. With the Agena attached, it would be hard to make the de-orbit maneuvers needed to bring the crew back to Earth. Moreover, reentering the atmosphere with the large mass of the Agena swinging at the end of a cable would be extremely dangerous. The solution was to fire a pyrotechnic charge that would eject the docking bar on which the tether would be attached. As a backup, a relatively weak link that could be snapped by a reasonably large separation velocity would be built into the tether. (GATV) during the first orbit, which was successfully completed in just over 1V2 hours after lift-off. Then it was time for Gordon to leave the Gemini capsule and move forward to the docked Agena and attach the tether, which was housed in the Agena target docking adapter, to the docking bar on his own Gemini capsule. He found this an extremely difficult job, because the Gemini and Agena turned out not have enough holding rails or foot restraints built into them. Gordon finally did manage to secure the cable, but only after a long and very tiring struggle. For the tether experiment there were now two ways to proceed. For the first, the gravity-gradient test, the docked vehicle combination would assume a vertical position, with the Gemini on top. The crew would then undock and back their Gemini out of the Agena docking cone until the tether would be taut. The small difference in gravity acting on each spacecraft, due to their different altitudes, would ensure that the two would remain in a vertical position while circling Earth together. For the second test, the crew would fire the Gemini attitude control thrusters to induce a rotation of a safe 1 degree per second to the Gemini-Agena combination. That would make the two spacecraft cartwheel around their mutual center of mass, with the centripetal force keeping the line taut and the two vehicles safely apart. The crew started with the gravity-gradient method. While carefully separating the two vehicles, the initial tension in the only partly deployed tether made both the Agena and the Gemini immediately move in unintended directions. However, Conrad quickly got the Gemini under control using the onboard attitude control thrusters. The Agena also had a set of thrusters that it automatically fired to adjust its own motion. Meanwhile, the two vehicles continued to back away from each other. Then, when about 15 meters had been deployed, the tether stuck, probably because it was blocked in the stowage container. With a burst of the Gemini's thrusters Conrad managed to jerk the cable free, but shortly after that the tether got caught again, this time on some Velcro that had been used to keep the cable wrapped up at the Agena's end. Moving the Gemini away from its vertical position with respect to the Agena, Conrad managed to peel the tether off the Velcro pad. However, that made the Agena lose its attitude stability again (Fig. 4.2). pitch direction. 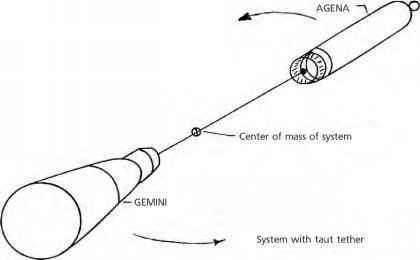 Because of the complicated combined motions caused by the pull of the tether, it proved to be impossible to align the Gemini and Agena vertically with Earth and keep them in a stable position. The two crew members were therefore told to abandon their attempt at gravity-gradient stabilization and to proceed to the second mode. For that, the crew first sent a signal to the Agena to turn off its automatic attitude control system, because otherwise it would refuse to rotate together with the tether. When Conrad then tried to start the rotation, he encountered another problem. "This tether's doing something I never thought it would do. It's like the Agena and I have a skip rope between us and it's rotating and making a big loop,'' he told Mission Control. Gordon then commanded the Agena to turn its attitude control back on, in the hope that that would help. But the disturbing motions persisted, causing him to report: "Man! Have we got a weird phenomenon going on here. This will take somebody a little time to figure out.'' For 10 minutes the two crew members fought to straighten the tether. They finally managed, although both men never really understood what it was exactly they had done that stopped the cable's weird behavior. Now the slow cartwheel motion could be initiated. Conrad gently fired his thrusters, but nevertheless the tether soon had a big loop in it. The engineers on the ground told the crew to wait and see whether the centripetal force would pull the line straight. Soon the astronauts saw that this was indeed the case. Initially the vehicles at either end of the rope wigwagged a bit, but that movement also dampened out without any action from the crew. The astronauts managed to put the spacecraft combination in a steady, 38-degree-per-minute rotation as the spacecraft moved into the night side of its orbit. The movement was so stable that the astronauts were able to eat their evening meal undisturbed. Clearly, this mode of station keeping was working far better than the first one. However, the rate of rotation was still about 40 percent less than originally planned, so when the capsule passed back into daylight Ground Control told Conrad to increase the spin rate. Somewhat reluctantly, the crew agreed to give it a try. Then Gordon suddenly shouted, "Oh, look at the slack! ... It's going to jerk this thing all to heck.'' The acceleration had caused a sudden increase in the tension in the tether, which resulted in what Conrad called "this big sling shot effect.'' The crew members found themselves being seesawed in pitch direction by up to 60 degrees. Clearly unhappy with the whole maneuver, Conrad told Flight Director Clifford E. Charlesworth, "You just ruined a good thing.'' 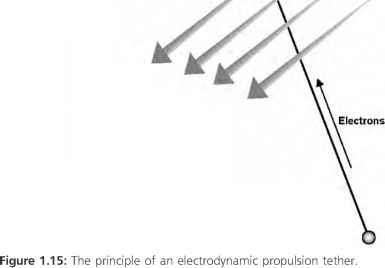 Nevertheless, Conrad managed to kill the oscillation movement of his vehicle with the use of the control thrusters. Surprisingly, the Agena's automatic control system managed to stabilize that spacecraft as well. The rotation rate of the combination was now 55 degrees per minute, close to the intended 1 degree per second. With one full 360-degree rotation thus taking over 6 minutes, the resulting amount of artificial gravity was of course tiny and could not be felt by the crew. However, the level of gravity was noticeable, because when the crew members put a camera against the instrument panel and let it go, it slowly moved to the rear of the cockpit in a straight line. After being tied to the Agena for 3 hours, the crew ended the tether experiments by jettisoning the spacecraft docking bar. Gravity-gradient stabilization had proven to be very difficult to realize, and the mission had not been able to successfully demonstrate it. The rotation method had not been easy to handle either, but Gemini 11 had at least proven that the concept worked.